Braai in the patio - mission accomplished! Braai in the patio—mission accomplished! The holidays have passed but this is no reason not to enjoy the beautiful summer evenings and warm weather. This is why today at homify, we've put together some tips and tricks when it comes to including a braai in the patio area. This will allow you to create a social and functional space that can be shared with family and friends. 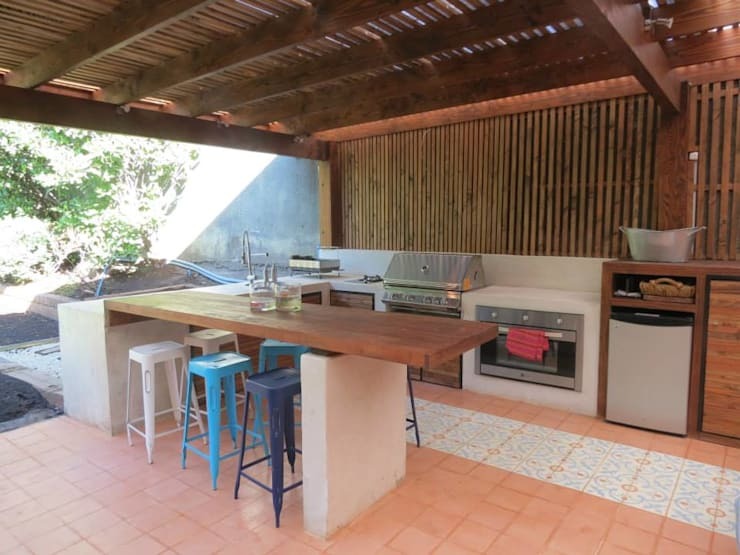 Finding a corner in the patio where you can create a little braai nook is key. 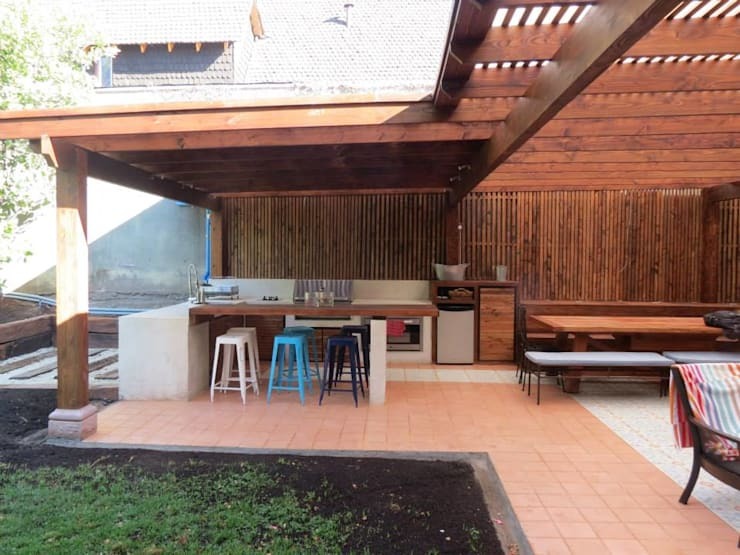 To inspire you, we will take you on a before and after journey where design professionals Obraa Quinchos Y Terraz have renovated an outdoor area, creating a beautiful braai terrace. As we explore the construction of this outdoor patio, we can see how the designers have created a foundation that is tiled. This is a very durable and trendy material. The designers have installed a wooden roof with thin, wooden pillars. This keeps this area protected from rain, wind or bright sunlight. The wooden roof extends into the area of the home, creating the feeling of spatial continuity. Here we come across the indoor kitchen, where the designers have installed a U-shape space for preparing food for the braai. On the one side, a little kitchen bar creates a cosy little nook with some bar stools. This is the perfect spot for a casual meal or some chats over a glass of wine. It also looks onto the garden, meaning that the family and friends have a great view from this spot! From under the covering and in the middle of the terrace, we can see that light floods this space thanks to the design of the roof. The openings along the sides also allows continuous views of the beautiful garden that surrounds the braai area. Parents can keep an eye on the kids while they play on the lawn! 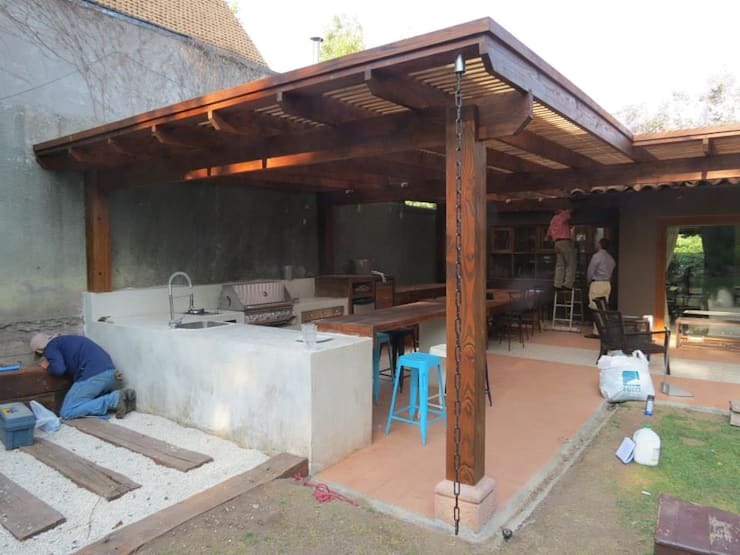 As the outdoor space takes shape, we can see how the wooden roof works in harmony with the terracotta tiled floors. 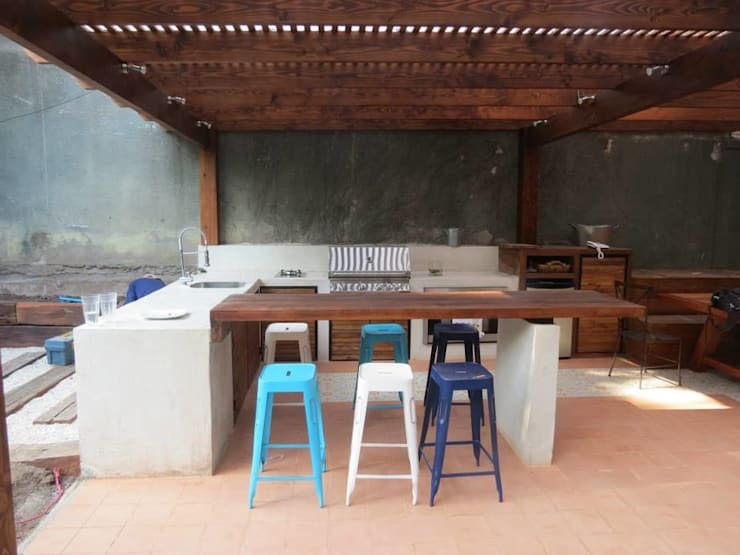 Wooden furniture is also featured throughout this braai area. This creates a very earthy and homely environment, where different textures and tones come together. As we've mentioned before, wood is used not just for the covering but for the table tops, furniture and other areas of this outdoor space. This gives the whole area a slightly rustic look and feel. The mix of earthy and beige tones is perfect for this outdoor area. From this angle, we can see how we end up with three different materials under one roof. 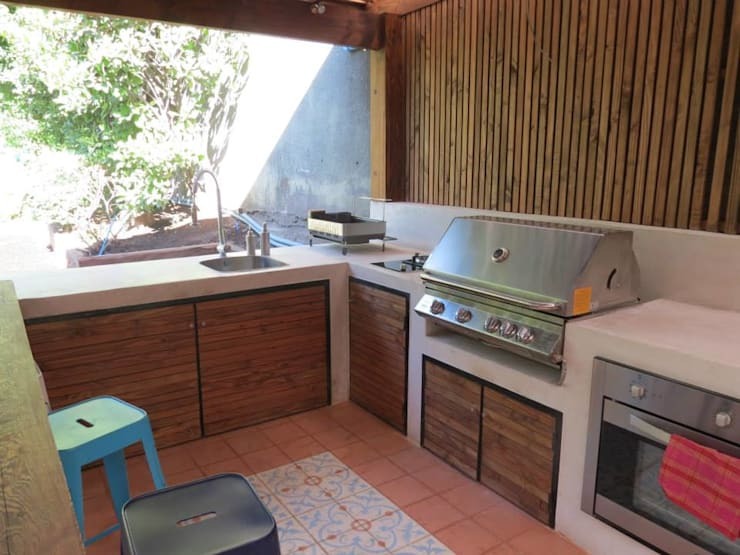 We have the outdoor kitchen and braai area, which is directly connected to the garden as well as a large dining area for family gatherings. In the background, we also spy a small lounge area with wooden furniture for more casual interactions or simply relaxing with a good book. 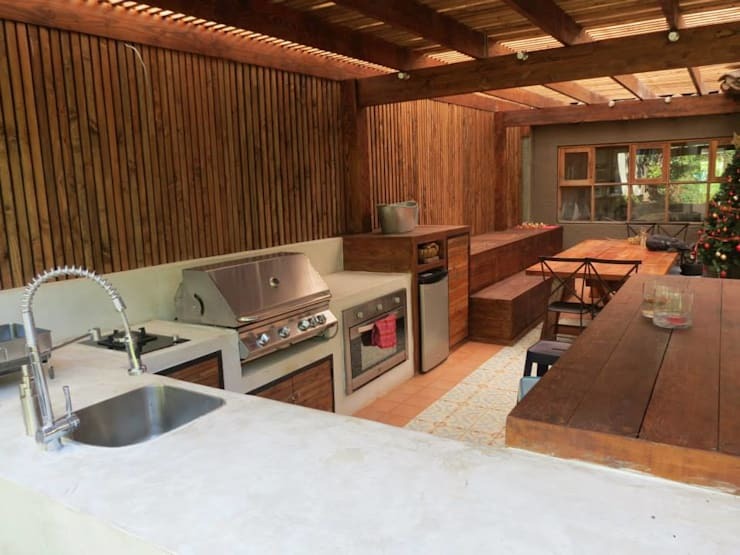 The design of this outdoor kitchen and braai area is wonderful, simple, practical and functional. It also doesn't involve a big budget. 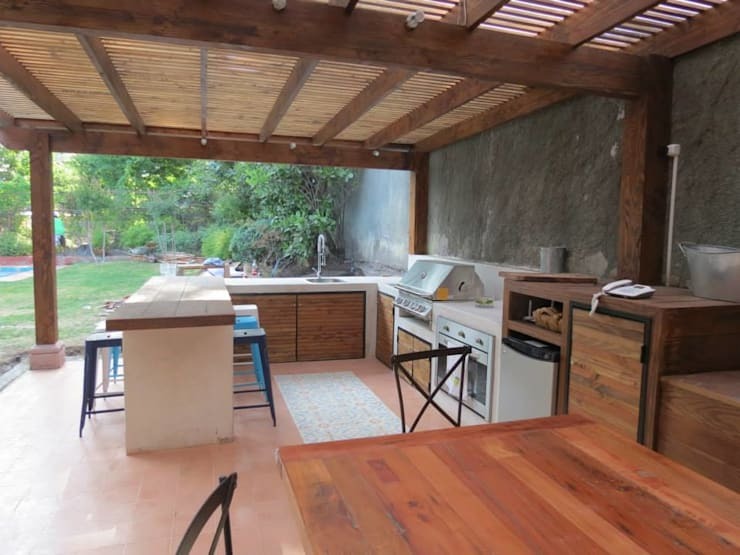 If you've enjoyed exploring it, you'll love this article: 7 Clever and cool ideas for outdoor kitchens. Also have a look at these 14 braais you'll want this summer.